The infinitely superior version of Stieg Larsson's source material, David Fincher brings some much needed Hollywood production value to The Girl With The Dragon Tattoo, still a very watchable story with a ink-black undercurrent. 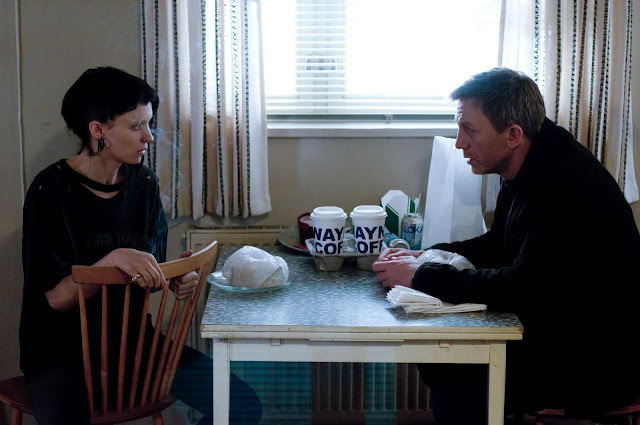 Most notable in the changes bought in by a director suited to this sort of thing is the cast; Daniel Craig taking the Mikael Blomkvist role, Rooney Mara in as the titular girl, Lisbeth Salander. Craig in particular is a vast upgrade from the shambling, mis-cast, Michael Nyqvist whose own take on Blomkvist never felt right. Where the source character is charming, clever and driven, Nyqvist felt grey and prepossessed with a desire to get the hell out of dodge. Craig, who clearly brings elements of Bond to the role, captures Blomkvist's roguish elements to a much more focused degree. Fincher's narrative changes the source towards the end but otherwise keeps pace with both the previous version and Larsson's novel, dragging the failings of that piece with it. Salander and Blomkvist spend far too much time apart, leaving the mystery dragging its feet until the former arrives to spur things on quickly, deciphering a clue you feel Blomkvist should have seen. More of the two leads, who 'interact' in ways advanced beyond your typical character relationships, would have paid dividends. There's an overuse of background news channels to tell the story by Fincher too and occasionally the script wanders in to techno- babble ('I Googled him', still feels like it has no place in a screenplay) but this is, by-and-large, very strong stuff and the modified ending is typical of the director's crystal clear grip on the narrative. I think that the remake is superior to the original as well. Craig totally was better in this part than Nyqvist. As for Rapace and Mara, I think they both gave great performances, just slightly different ones, and I like that Mara didn't simply copycat what Noomi has already done with this character. Yes, agree. Mara seemed quieter than Rapace, I can only imagine that was deliberate but definitely both work. Enjoyed the score too but couldn't help but feel it recycled a bit too much of The Social Network. Would rather Fincher doesn't pick Trent Reznor and Atticus Ross to score his next project. "'I Googled him', still feels like it has no place in a screenplay." Yes. I think that should be added to screenwriting manuals across the globe. I can't pin down why it feels so wrong but it definitely does. I also think everyone should be forced to wear a trilby and keep 'files'.